Oh man, it’s a crazy time of the year between school, rehearsals for my play, and college apps, but I’m trying to make time for cooking in the midst of it all- it helps keep me grounded and sane. 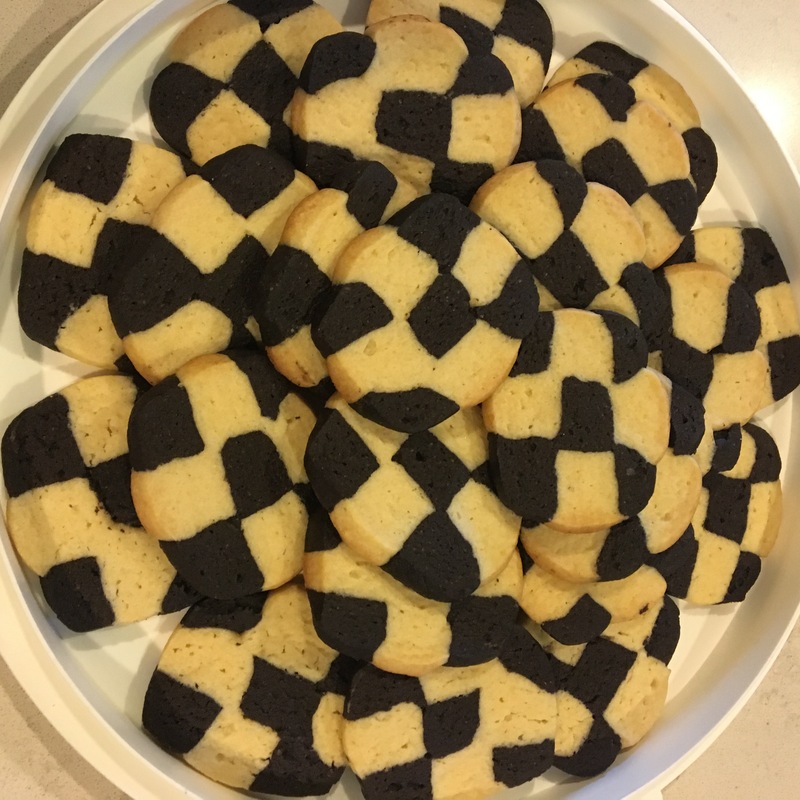 These cookies were especially therapeutic to make. It’s an easy variation on the swirled cookies from awhile back and the dough is a dream to prep and store in the fridge or freezer and then just slice and bake whenever! Make the cookie dough according to directions in the pinwheel cookies, stopping when you have two balls of dough, one chocolate and one vanilla. Preheat an oven to 350 degrees and grease 2 cookie trays. Roll each ball of dough out until about 8 inches on each side. Chill squares for half an hour. Working with one square at a time, slice dough into 9 even strips. Once all dough is sliced, begin constructing squares. Start with one layer of chocolate, vanilla, chocolate topped with vanilla, chocolate, vanilla and then finished with another row repeating the first pattern. This should use nine strips, 5 chocolate and 4 vanilla. Then, make another block, reversing the patterns and using 5 vanilla and 4 chocolate strips total. Wrap logs and refrigerate for 45 minutes. Remove each log and slice into even quarter inch thick slices. Place on prepared baking sheets and bake for about 12 minutes. Let cool for another 10 before eating. Previous Previous post: Day 149: chocolate chocolate chip!